mTOR (mammalian target of Rapamycin) is a protein that in humans is encoded by the mTOR gene. mTOR is a serine/threonine protein kinase that regulates cell growth, cell proliferation, cell motility, cell survival, protein synthesis, and transcription. mTOR belongs to the phosphatidylinositol 3-kinase-related kinase protein family. mTOR integrates the input from upstream pathways, including insulin, growth factors and amino acids. mTOR also senses cellular nutrient, oxygen, and energy levels. The mTOR pathway is dysregulated in human diseases, such as diabetes, obesity, depression, and certain cancers. Rapamycin inhibits mTOR by associating with its intracellular receptor FKBP12. The FKBP12-rapamycin complex binds directly to the FKBP12-Rapamycin Binding (FRB) domain of mTOR, inhibiting its activity. 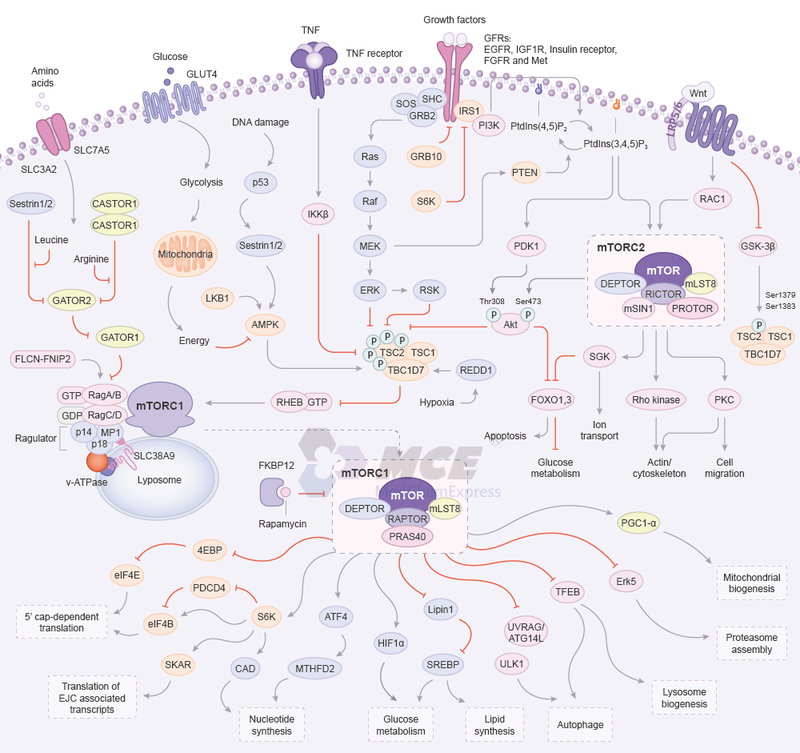 The mammalian target of rapamycin (mTOR) signaling pathway integrates both intracellular and extracellular signals and serves as a central regulator of cell metabolism, growth, proliferation and survival. mTOR is the catalytic subunit of two distinct complexes called mTORC1 and mTORC2. mTORC1 comprises DEPTOR, PRAS40, RAPTOR, mLST8, mTOR, whereas mTORC2 comprises DEPTOR, mLST8, PROTOR, RICTOR, mSIN1, mTOR. Rapamycin binds to FKBP12 and inhibits mTORC1 by disrupting the interaction between mTOR and RAPTOR. mTORC1 negatively regulates autophagy through multiple inputs, including inhibitory phosphorylation of ULK1 and TFEB. mTORC1 promotes protein synthesis through activation of the translation initiation promoter S6K and through inhibition of the inhibitory mRNA cap binding 4E-BP1, and regulates glycolysis through HIF-1α. It promotes de novo lipid synthesis through the SREBP transcription factors. mTORC2 inhibits FOXO1,3 through SGK and Akt, which can lead to increased longevity. The complex also regulates actin cytoskeleton assembly through PKC and Rho kinase. Growth factors: Growth factors can signal to mTORC1 through both PI3K-Akt and Ras-Raf-MEK-ERK axis. For example, ERK and RSK phosphorylate TSC2, and inhibit it. Insulin Receptor: The activated insulin receptor recruits intracellular adaptor protein IRS1. Phosphorylation of these proteins on tyrosine residues by the insulin receptor initiates the recruitment and activation of PI3K. PIP3 acts as a second messenger which promotes the phosphorylation of Akt and triggers the Akt-dependent multisite phosphorylation of TSC2. TSC is a heterotrimeric complex comprised of TSC1, TSC2, and TBC1D7, and functions as a GTPase activating protein (GAP) for the small GTPase Rheb, which directly binds and activates mTORC1. mTORC2 primarily functions as an effector of insulin/PI3K signaling. Wnt: The Wnt pathway activates mTORC1. Glycogen synthase kinase 3β (GSK-3β) acts as a negative regulator of mTORC1 by phosphorylating TSC2. mTORC2 is activated by Wnt in a manner dependent on the small GTPase RAC1. Amino acids: mTORC1 senses both lysosomal and cytosolic amino acids through distinct mechanisms. Amino acids induce the movement of mTORC1 to lysosomal membranes, where the Rag proteins reside. A complex named Ragulator, interact with the Rag GTPases, recruits them to lysosomes through a mechanism dependent on the lysosomal v-ATPase, and is essential for mTORC1 activation. In turn, lysosomal recruitment enables mTORC1 to interact with GTP-bound RHEB, the end point of growth factor. Cytosolic leucine and arginine signal to mTORC1 through a distinct pathway comprised of the GATOR1 and GATOR2 complexes. Stresses: mTORC1 responds to intracellular and environmental stresses that are incompatible with growth such as low ATP levels, hypoxia, or DNA damage. A reduction in cellular energy charge, for example during glucose deprivation, activates the stress responsive metabolic regulator AMPK, which inhibits mTORC1 both indirectly, through phosphorylation and activation of TSC2, as well as directly through the phosphorylation of RAPTOR. Sestrin1/2 are two transcriptional targets of p53 that are implicated in the DNA damage response, and they potently activate AMPK, thus mediating the p53-dependent suppression of mTOR activity upon DNA damage. During hypoxia, mitochondrial respiration is impaired, leading to low ATP levels and activation of AMPK. Hypoxia also affects mTORC1 in AMPK-independent ways by inducing the expression of REDD1, the protein products of which then suppress mTORC1 by promoting the assembly of TSC1-TSC2.
. Laplante M, et al.mTOR signaling at a glance.J Cell Sci. 2009 Oct 15;122(Pt 20):3589-94.
. Zoncu R, et al. mTOR: from growth signal integration to cancer, diabetes and ageing.Nat Rev Mol Cell Biol. 2011 Jan;12(1):21-35.
. Johnson SC, et al. mTOR is a key modulator of ageing and age-related disease.Nature. 2013 Jan 17;493(7432):338-45.
. Shimobayashi M, et al. Making new contacts: the mTOR network in metabolism and signalling crosstalk.Nat Rev Mol Cell Biol. 2014 Mar;15(3):155-62.